With their teeth constantly growing throughout their lifetime, daily chewing activities to wear the teeth down is a necessity for guinea pigs. Timothy or alfalfa hay is rich in silicates that will help teeth wear naturally. Chew toys should also be provided in the form of cardboard tubes, boxes or wooden blocks. 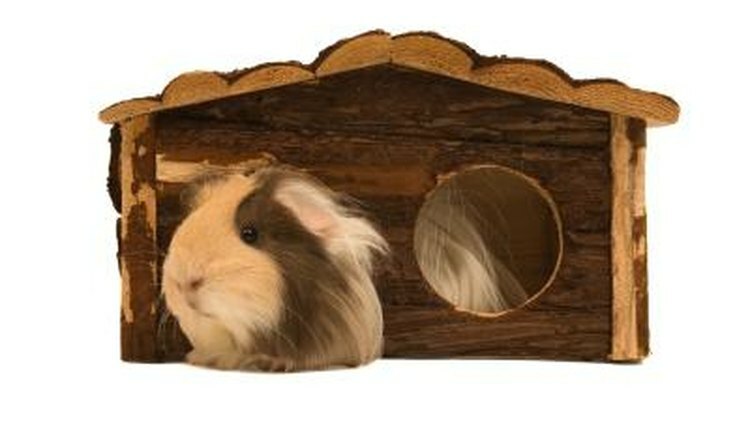 Pet stores carry wooden blocks suitable for your guinea pig to chew on. Nontoxic alphabet blocks designed for human babies can also be used and make a charming backdrop to your cavy's cage. Alternatively, purchase hardwood lumber at your local hardware store and saw it into blocks for your guinea pig to chew. You can also trim branches from your apple or other fruit tree to saw into blocks, as guinea pigs enjoy nibbling the fragrant wood. Cedar and pine bring a fresh smell to a guinea pig cage, but the same phenols that cause the fresh scent cause liver and kidney damage when used over time. Your guinea pig's nose is pressed right up to the wood when he is chewing it, opening him up to respiratory diseases caused by the phenols in the fragrant wood.